A festival lineup announcement is always a good thing to wake up to, and for those who have been waiting patiently since the first announcement in late February, today did not bring disappointment. 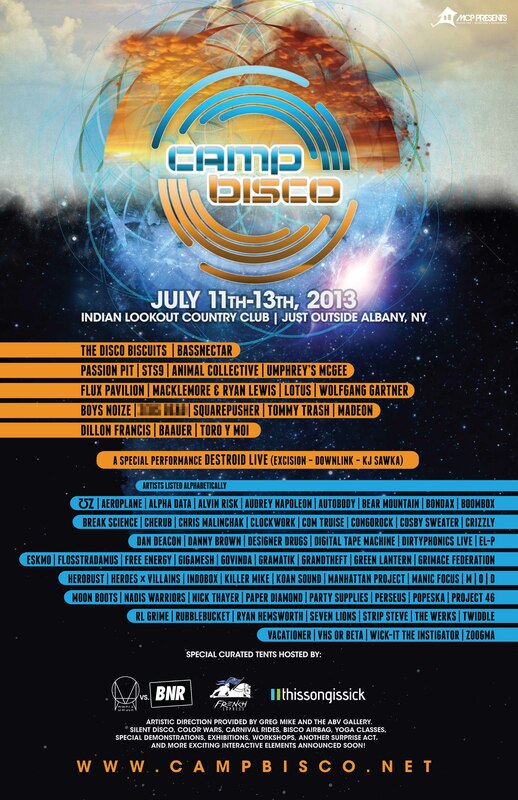 Among the 12 new additions to Camp Bisco’s already star studded lineup are Madeon, Danny Brown, Seven Lions, Bondax, Digital Tape Machine, Moon Boots, Perseus, Strip Steve, Autobody, Alpha Data, Manhattan Project, as well as the new collaboration between Excision, Downlink, and KJ Sawka, Destroid. This years festival will also feature curated tents hosted by OWSLA, BoysNoize Records, French Express, and Thissongissick.com. Along with these names, a special “surprise act” was announced, and if you check out the new flyer online and step away from your screen, you can just barely make out who it will be (Hint: Pulp Fiction)! In addition to artists, a few new things will be coming to camp this year. Following in the footsteps of other, larger music festivals, this year Camp Bisco will host several carnival rides for the first time, as well as a “Bisco Airbag”, much like the one you may have seen at Counterpoint Music and Arts Festival. As the festival continues to grow, so does the production, and you can expect to see much more in terms of art and light installations, workshops, exhibitions, and interactive elements. There is also a rumor that they are experimenting with surround sound for the camp sites, so you can continue the party while getting away from the crowd. All of this and more, including information on the new 50/50 payment plan can be found online at campbisco.net. One of the most exciting acts added to the festival is Seven Lions, the melodic dubstep producer who popped up early last year with a sound that goes from sweet to savage very quickly. Keep your eyes peeled for Bondax, this duo beautifully mixed dubstep, garage, and R&B to create a sound that will best be enjoyed under the sun and lights of camp. One of the most notable acts in this second wave of artists and arguably in the whole festival is Destroid, which is a collaboration between dubstep heavy hitters Excision and Downlink with KJ Sawka, the former drummer of Pendulum. Expect the heaviest of drops and the highest of energy.